Known in the skin cancer community as “The Beast - melanoma, one of the fastest growing cancers worldwide, does not discriminate. Although it is commonly misunderstood and underestimated, it can affect anyone regardless of age, race or gender. In February 2005, a mole on my husband, Richard's, back had begun to itch. A biopsy was performed and a week later we learned it tested positive for melanoma. The cancer was removed by a procedure called Mohs surgery and we were told the lesion was thin and no further treatment was necessary. I was never aware that Richard’s life could be in jeopardy. In fact, I considered us lucky! We noticed the mole and promptly had it taken care of - end of story - so I thought. Five years, later on February 19, 2010, I lost the love of my life, who was only 46 years old, to melanoma. We were totally blindsided! We had just celebrated the holidays, become grandparents for the first time, and were looking forward to a promising new year. But on the morning of January 3, 2010, something was clearly not right. Richard began experiencing sciatic pain and tenderness in his lymph nodes. Because of the sudden discomfort he was in, I took him to the emergency room. We tried to rationalize how we went from ringing in the New Year just two days prior to sitting there in an emergency room, anxiously awaiting answers for symptoms that seemed to crop up overnight. The wait seemed long so I clung to the cliché that no news was good news. But when the doctor finally returned to the room and closed the door, my heart sank. We were informed that a chest X-ray and CAT scan had revealed several small masses in Richard’s lungs. In disbelief, I wanted desperately to crawl back into 2009. Next came a referral to an oncologist. It would be another week before the diagnosis was confirmed - metastatic melanoma stage IV. It was decided that our best option for treatment was to travel to the University Of Texas M.D. Anderson Cancer Center in Houston. It would be two long weeks before Richard’s first appointment on January 25, 2010. Again, we waited. As each day passed, his physical pain became more obvious and unbearable. I was desperate to ease his suffering, but even the prescribed medications proved to be ineffective. The discomfort he endured complicated our flight plans as well, making it extremely difficult to travel comfortably. Not realizing just how fast the cancer was progressing, we tried to remain hopeful and optimistic. All of our hope and energy were directed toward fighting a battle that was over before it began. Just three weeks after we arrived in Houston, and less than seven weeks after the diagnosis, Richard's suffering was over. He was gone. I felt like the rug had been ripped out from underneath me.... it was too much to process! A dear friend gave me a copy of "Jesus Calling", a best-selling Christian devotional by Sarah Young. I discovered that she, too, had melanoma. My mom also shared that her former husband had also died of Melanoma at the age of 44. She hadn't said anything when Richard was diagnosed because she didn't want to scare me. Melanoma wasn't just too close to home, it was home - not once, but twice! I couldn't just sweep it under the rug. My anger shifted and was now directed at the melanoma. It is still difficult to comprehend how rapidly it metastasized. We never saw it coming. Richard literally appeared strong and healthy one day, but not the next. Though we believed having it surgically removed meant we had taken care of it, we really didn’t have a clear understanding of melanomas’ extremely aggressive nature and what can happen if you don't catch it early. I wasn't looking to place blame because nothing I said or did was going to bring my husband back. Instead, my desire was to honor Richard’s memory by fighting in my own community. The pain Richard endured wasn't going to be in vain. Melanoma was not going to get the final say! The more I learned about melanoma, and the more I learned how little others knew about the realities of this cancer, the more passionate I became to do something about it. I didn't want anyone else to be caught off gaurd. Melanoma is the fastest growing preventable cancer in North America and, while it is one of the easiest cancers to self-detect, if not caught early, it is among the most incurable of all cancers. As a caregiver, I felt defenseless. Richard's melanoma was relentless and we could not control how quickly it spread. But what I could control was spreading melanoma awareness so that others might avoid the same heartache that my family went through. It was during the "Head for the Cure" 5K race in August 2011 (where I participate to support brain cancer in memory of my friend Diane) that an overwhelming rush of energy came over me... my community needed an event like this for melanoma! I certainly didn't feel qualified or capable of doing this on my own, so I asked God for a sign that this was truly coming from Him. The very next morning, I received a phone call from a colleague of Richard's who said he had struggled on whether or not to call me, but he was desperate. He had lost his sister to melanoma when she was in her thirties, and now his 32-year-old daughter had just been diagnosed with skin cancer. He was scared, searching for answers, and hoping that I might be able to shed some light. To me, this would validate what I felt in my heart; God was calling me to be a melanoma advocate. A week later, I met with a local race management company to discuss plans for my inaugural 5K run/walk. Heading out the door, I stopped to grab my mail and a magazine caught my eye. On the cover were the words "outpace cancer". Immediately, "Outpacing Melanoma" rolled off my lips. As I looked down and saw Richard's name on the address label, I smiled and knew I now had the perfect name. My vision became a reality in October 2011 when I established Outpacing Melanoma Foundation, a 501(c)3 non-profit organization dedicated to fund research and increase public awareness in the community by promoting early detection, screening, and prevention. The purpose for creating my own melanoma foundation was to make a positive impact here in my own backyard - in the KC region and the state of Kansas. 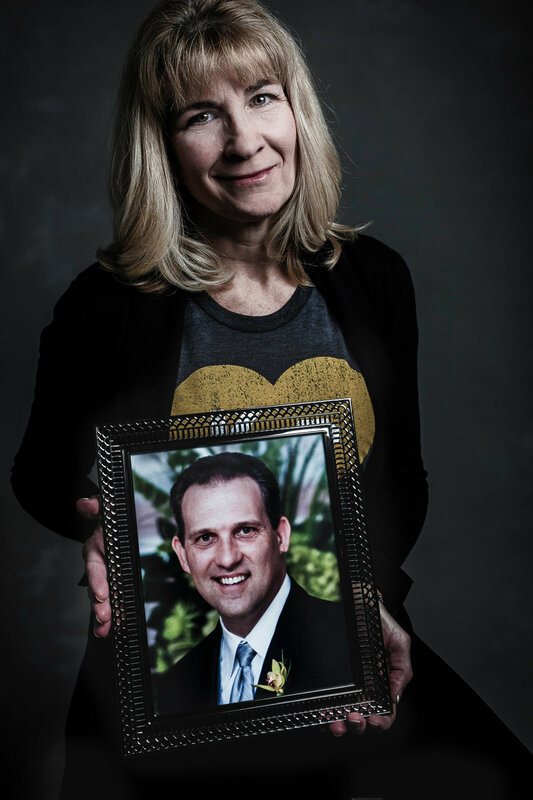 I was determined to make my community a place where people could seek the best treatment for any stage of melanoma. We can’t just sit back and wait for a cure while most melanoma deaths can be prevented by early detection and screenings. Sadly, a lot of melanoma victims are simply not educated about the disease until it's too late. In the last few years significant progress has been made in understanding melanoma and today, there are promising treatment options for those with advanced stage melanoma. But, it is my hope through Outpacing Melanoma, that lives can be saved by stopping the melanoma before it starts. Our goal is to prevent it - not just treat it! The Foundation is funded primarily through proceeds from our Outpacing Melanoma 5K Run/Walk and our slogan is, "Don't Delay, Get Checked Today!" My greatest hardship was losing Richard to Melanoma. They say that time heals... it doesn't, only God does. God doesn't allow us to go through something for nothing. It is through our struggles that we are strengthened in order to help others. The Outpacing Melanoma Foundation has not only given me a new sense of purpose, but being proactive has given me a bit of power back that the cancer had taken away. For my family, it’s too late for our story to have a happy ending. But I continue Richard’s fight in the hope that others will have a fighting chance. Outpacing Melanoma is a 501(c)(3) non-profit organization dedicated to funding research for and increasing awareness of melanoma by promoting prevention, screening and early detection throughout the Kansas City region. Melanoma, the most deadly form of skin cancer, is an often-neglected disease. Outpacing Melanoma is dedicated to fighting this disease - every step of the way.